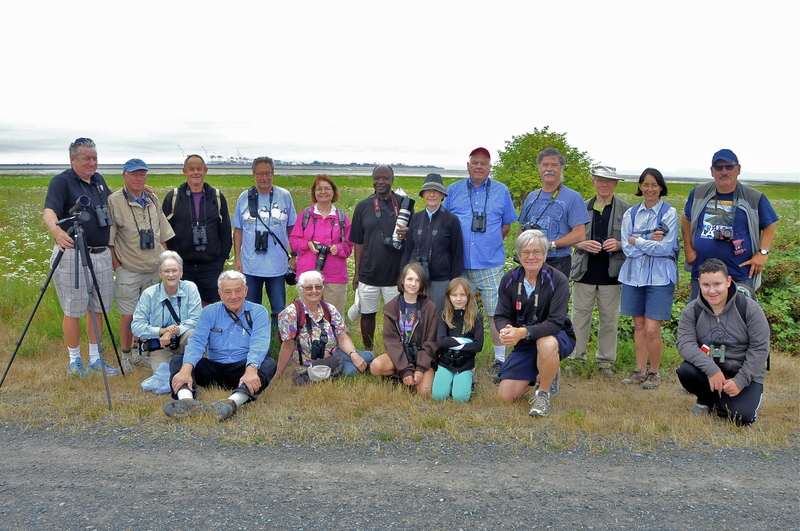 More than 20 “almost birders” enjoyed another gorgeous Delta morning wandering along the dike path at Brunswick Point. The Shorebirds are arriving here in big numbers for their “feeding pit-stop” on their way south and we had a few other hi-lites including Bullock’s Oriole and a sand-dusting Marsh Wren. Check out the photo evidence (photogs Jonathan, Liz, Terry, Marion, Glen, Ken) including the partial Group Photo on our DNCB Picasa site. The ten “regulars” left Petra’s at 7:30 a.m. (4 vehicles – poor car-pooling) and our first stop was along the causeway to the Tsawwassen Ferry Port. The tide was very low so no birds were close. On the south side of the road we saw a pair of Black Oystercatchers with their son/daughter. A Cormorant swallowing a fish was neat. Near the ferry berths a small flock of Harlequin Ducks was loafing on the rocks just below us, but no Whimbrels seen. The rock island was surprisingly covered with more than 100 lazing Harbour Seals. We continued on through the TFN land and the Ladner fields to River Road and then to Brunswick Point where Ken (thankfully with his scope, but without Anne) and others were waiting or sporadically arrived soon thereafter. 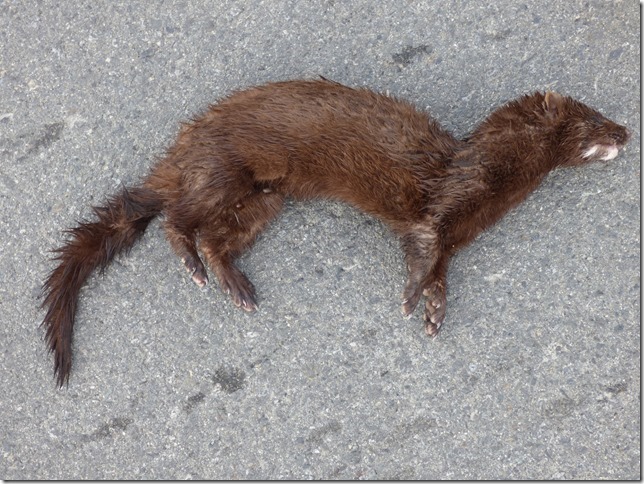 Early birder Langley Tom spotted a Mink in the dyke rocks; coincidentally, Roger had stopped to photograph a roadkill Mink en route to Brunswick Point with his grandchildren. Along the start of the trail several Cedar Waxwings were in the trees and House Finches and Savannah Sparrows in the bushes. Then we were surprised by a small bird sand-dusting itself in the middle of the path. This juvenile Marsh Wren was very accommodating, seemingly not bothered by us a mere 10 feet away. Mom made a fly-past and the youngster then took off after her. Further along we met Liz, then Aussie Nance, Langley Tom and Grandpa Roger with Jaeda and Ashley. American Goldfinches were everywhere. Also lots of Red-winged Blackbirds (and Brown-headed Cowbirds?) 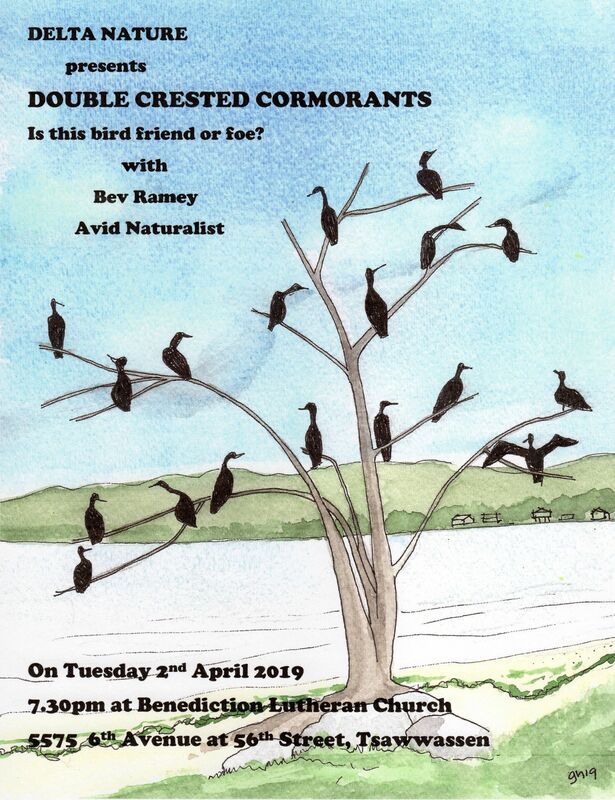 and European Starlings. Warblers were scarce, other than the occasional Common Yellowthroat. A few Northern Harriers glided by and a Bald Eagle with a huge rodent in its claws entertained the photogs. Various Wildflowers were in beautiful bloom and fortunately Jaeda & Ashley were able to identify several of them for us. It’s very refreshing, and helpful with their much keener eye sight, when young people like Julian and Roger’s grandkids join us on our outings. On the path further along, closer to the shore, we finally saw some Shorebirds, Western Sandpipers and Killdeer. Terry got a photo of a Least Sandpiper too. In the bushes among the Goldfinches were a couple of young Bullock’s Orioles that the “good birders” saw and photographed. Others were watching a less-interesting White-crowned Sparrow. As we lounged in someone’s deck chairs on the shore, enjoying the ambiance, the cooing of Eurasian-collared Doves and time-challenged Bryan & Janet’s arrival, huge flocks of Swallows, mostly Barn with a few Tree Swallows, hawked insects around us and then landed in rows on lines and barn eaves. Although the tide was coming in, the large numbers of birds in the Strait on the horizon were too difficult to identify (mostly Gulls). White Rock Al (aka BOB Al, Birder on Bike) rode to the railway track end of the trail, but reported back saying he saw no new Shorebird species. As we walked back to our vehicles, more small swarms of Peeps were seen closer to shore, but it was approaching Noon so we couldn’t stay for the tide to bring them closer for better viewing. A Red-tailed Hawk circled above, not far from their nest near 28 Avenue, but we were blanked on the House Wren, apparently seen at Brunswick a few days earlier. Some DNCBers continued on to Reifel and saw other Shorebirds including Dowitchers, Red-necked Phalarope, Yellowlegs, Semi-palmated Sandpipers and other Warblers (e.g. Wilson’s) and Waterfowl (e.g. Mergansers). Others went home to their spousal and grand-parenting duties, feeling exhilarated after another delightful morning outing. Next Wednesday, August 13 we will have Roger’s Ferry outing to Galiano Island. We will meet at the Tsawwassen Ferry port around 9:30 a.m. and take the 10:20 a.m. ferry, returning on the 5:50 p.m. ferry, arriving at 6:45 p.m. Check out our DNCB Blog for more details about this outing, such as lunch plans, walking difficulty, etc. Each participant will be asked to donate 10 bucks so one or two DNCBers (Mike, WR Al?) can bring his vehicle for “island transport”. 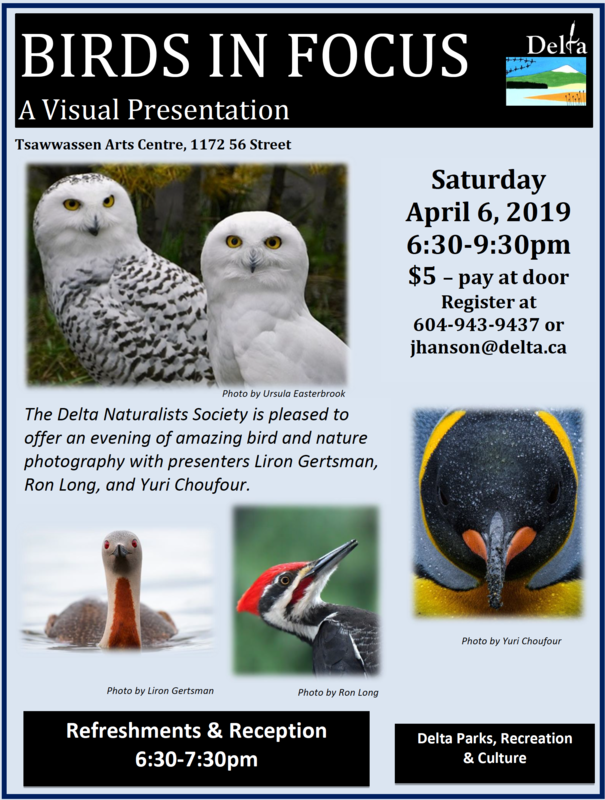 PLEASE EMAIL TOM or ROGER if you think you will be on the Galiano trip – pub needs to know approximate numbers for lunch. 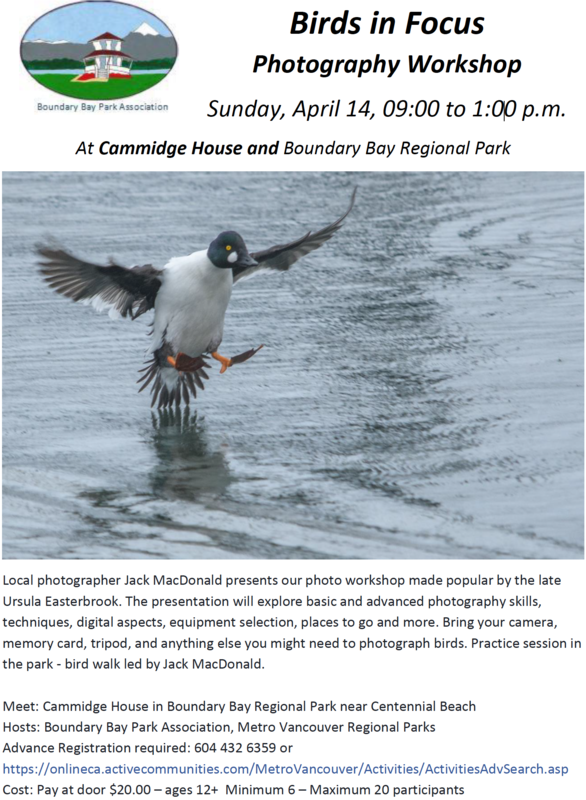 This entry was posted in *DNCB, Bald Eagle, Black Oystercatcher, Brunswick Point, Bullock's Oriole, Harbour Seal, Harlequin Duck, Least Sandpiper, Mink, Northern Harrier, Red-necked Phalarope, Red-tailed Hawk, Semi-palmated Sandpiper, Tsawwassen Ferry Port. Bookmark the permalink.